If you only like quiet, peaceful classical music, look elsewhere, because the Sinfonia Antartica will knock your socks off -- literally. It's based On Vaughan Williams' film score for the movie, SCOTT OF THE ANTARCTIC, and evokes that frozen, other-worldly landscape perfectly. In fact, it's so other-worldly I often find myself envisioning a lost expedition on Mars. Just substitute blowing dust for swirling snow . . . The Sinfonia Antartica is Vaughan Williams' 7th symphony, and I believe it is one the the greatest ever written. From the first notes of the first movement it begins to ascend, as if climbing a frozen mountain. The views are spectacular and the journey is very dangerous. Danger and Beauty are probably the prevalent themes throughout the work, though there is a charming little side trip in the second movement to a penguin colony. Scott's expedition ended tragically, and Vaughan Williams' symphony ultimately leads us into that gorgeous desolation, though a note of hope still persists, the very thing that leads explorers into wild places. That's why the overall effect of the Sinfonia Antartica is inspiration. The Wasps is the second piece on this album, and contrasts marvelously to the 7th Symphony. It was written at an earlier period in RVW's life, and is more conventional in style. But both pieces evoke marvelous images in the listener's imagination. Adrian Boult conducts them beautifully, this is a must-have album for the collector. When I was a kid, and just beginning to explore music, I loved a lot of the standards of classical music, and still do. 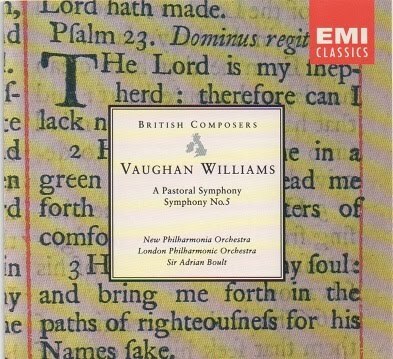 But the composer who ultimately captured my heart was Ralph Vaughan Williams, and he did it with the 3rd symphony. Prior to that time I had heard the emotionally and spiritually powerful THOMAS TALLIS FANTASIA and the delightful third movement of the LONDON SYMPHONY (also on EMI, conducted by John Barbirolli – Mr. Perfect Tempo). I heard these pieces on the radio, and didn't know who the composer was until my brother loaned me some cassette tapes, including the EMI, Adrian Boult recording of the 3rd & 5th symphonies. When I listened to them, I felt like a door in my soul had opened wide. The 3rd symphony evokes a beautiful, lonely landscape, probably inspired by the French countryside during World War I, in which R.V.W. served as an ambulance driver. Read Ursula Vaughan Williams' biography of R. V. W. for more information about this chapter of the composer's life. When I was writing my 5th book, I listened to the 3rd symphony over and over, trying to capture the tone. This is no easy task – I agree with other reviewers that the music of Ralph Vaughan Williams isn't easy to describe with words. 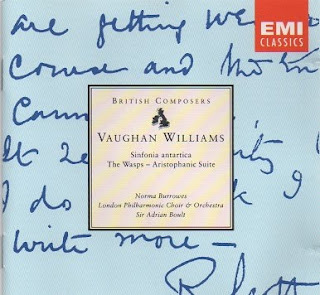 Symphony 5 was written during World War II, by which time writing symphonies was the best contribution Vaughan Williams could make to the war effort. Both symphonies express a profound appreciation for the beauty of nature, an acknowledgement of the sadness and loss of war, and a belief in hope for the future. It's funny, but when I'm listening to the music of Vaughan Williams I tend to see the wild and lonely places of Arizona, a landscape as different from England and France as it could possibly be. The 3rd symphony reminds me of Southern Arizona and the 5th always evokes the Grand Canyon. I think this is testimony to Ralph Vaughan Williams' ability to convey his deep understanding of and love for the wild places of the world. My heart is his, forever.